A Reef in Time is a book I have known about since it was published in 2008 but I only got around to reading it a few months ago. It is such a great book (great in the sense of masterful, imposing or significant, not fun) that I wanted to tell others about it via some sort of review, but I was daunted by the fact that Charlie Veron’s work is far beyond my capacity to critique in any meaningful way. He is, after all, a legend of reef science (see wikipedia or climateshifts or even his facebook page), while I barely dip my toes into the subject. When I started writing ‘A Reef in Time’, I knew that climate change was likely to have serious consequences for coral reefs, but even I was shocked to the core by what all the best science that existed was saying. In a long phase of personal anguish I turned to specialists in many different fields of science to find anything that might suggest a fault in my own conclusions. No luck. The bottom line remains: the GBR can indeed be utterly trashed in the lifetime of today’s children. That certainty is what motivates me to broadcast this message as clearly, as accurately and, yes, as loudly, as I can. 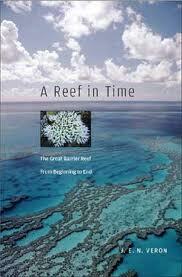 The book is also fascinating in its detailed account of the GBR itself, including a plausible account of a ‘stone age Utopia’ in which aboriginal peoples may have lived in caves under what, today (following a rapid rise in sea level at the end of the last glaciation about 11,500 years ago), are coral reefs. This is not a book for the fainthearted… Indeed, Veron believes we are on the brink of the sixth mass extinction of the planet. He makes his case in this book and paints a vivid picture of what we will be losing if we do not stop spewing greenhouse gases into the atmosphere… The book is easy to read with well-placed illustrations to explain complex concepts. It presents its argument in a logical and increasingly disturbing sequence that reaches a bleak end. It is a plea for urgent action written by a man who is passionate about the Great Barrier Reef. It should be read widely by anyone who cares about our planet. Climate science is advancing so rapidly that 2008 is a long time ago. Sadly, none of the recent news makes Veron’s predictions seem any less likely. See, for instance, “New Maps Depict Potential Worldwide Coral Bleaching by 2056” on Science Daily in February this year. Next Next post: Just what is “sustainablility”?